Alexes Harris, a sophomore and employee at the undergraduate admissions office, is supported as she speaks about her experiences with racism on campus. Students demanded the University take further action to support diversity and address racism at a town hall meeting Tuesday held in the wake of the campus-wide controversy surrounding a racist Snapchat post. 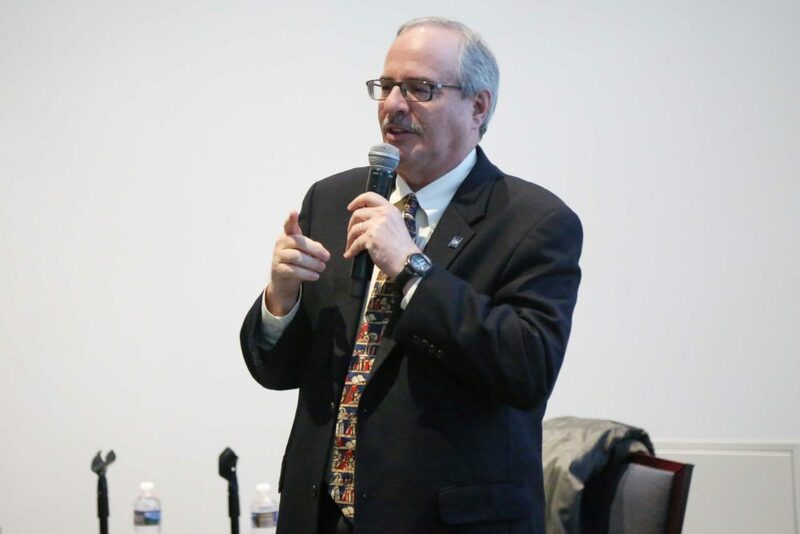 The town hall, held in a packed room in the Marvin Center, was the result of student calls for action earlier this month after members of the sorority Alpha Phi were depicted in a Snapchat showing one of the members holding a banana peel with the caption, “Izzy: ‘I’m 1/16 black.’” University President Thomas LeBlanc later committed to holding several meetings on race and diversity in the wake of the incident and said the post would lead to a further examination of the role of Greek life on campus. A group of top administrators who attended the event attempted to reassure the students gathered that improving the racial climate on campus was a top priority, pointing to a slew of measures – including mandatory freshman diversity training and Tuesday’s town hall – announced in the wake of the incident to address racism. Caroline Laguerre-Brown, the vice provost for diversity, equity and community engagement, and LeBlanc, who opened the event, said creating spaces – like the town hall – for administrators to hear student concerns is the first step toward making the campus more inclusive. LeBlanc said that in meeting with students over the past few weeks, he has heard from students of color that they “do not feel fully welcome” at GW. University President Thomas LeBlanc opened the town hall Tuesday by pledging to create a more inclusive campus community. “Frankly, diversity is our strength, but if there are people here who don’t feel welcome, we’re failing,” he said. Many black students voiced frustration at the treatment of students of color on campus. Raising issues like the bigoted history of campus buildings, racially charged remarks from faculty and mental health, many expressed skepticism that the steps announced earlier this month would be enough to improve their experiences on campus. In a conversation that occasionally turned heated, some students of color said they didn’t feel like the institution cared about their community. Student Association Sen. Imani Ross, U-at-Large, who was among the first to alert administrators to the Snapchat and introduced a resolution in the SA Senate earlier this month calling for the removal of the Alpha Phi from campus, said the University is advertised as a diverse school, but that often students from diverse backgrounds feel left out of the campus community. Ross said she felt the University wasn’t transparent enough about the results of the investigation into the Snapchat post. Officials said earlier this month that the two girls pictured in the post would not face disciplinary consequences because the girl who took the photo claimed responsibility for captioning and posting it. An investigation into the Alpha Phi chapter remains ongoing. “We’re having a conversation about moving forward, but we haven’t dealt with anything that actually happened and what we’re actually going to do with situations like that,” she said. Junior Faith Hudson said conversations about diversity are important, but they are limited in their effects because there needs to be institutional change to address a problem like racism. Following the town hall, Michael Tapscott, the director of the Multicultural Student Services Center, proposed multiple solutions going beyond dialogue to address students’ concerns. He mentioned diversity training and encouraging students to not affirm racist remarks or behavior by being silent. “We have to pay specific attention to the black student community and we have to be more on point with respect to how we handle that community,” Tapscott said. 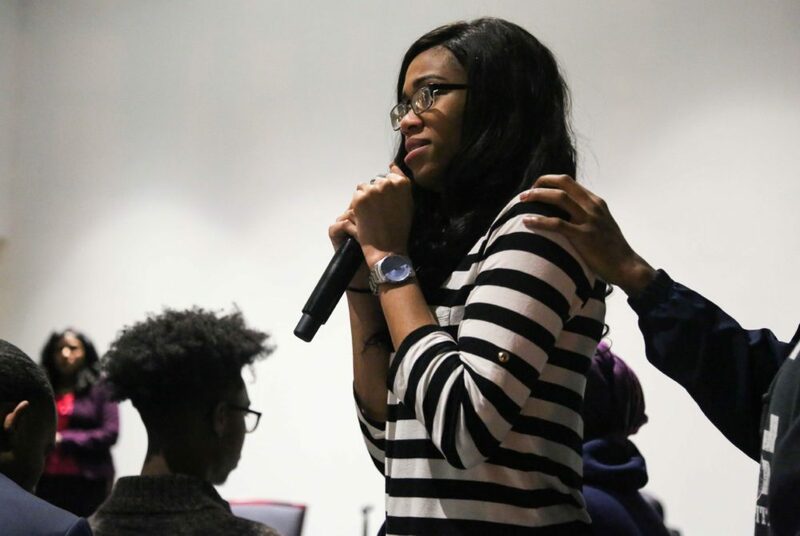 Sophomore Abiola Agoro said she didn’t feel like her questions were answered by administrators during the meeting and that there needs to be more tangible action – involving students – by the University to combat on-campus racism.